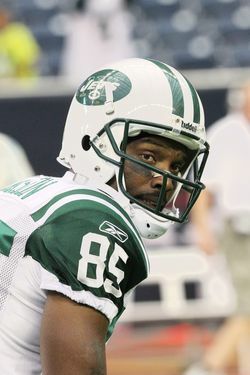 After the Jets lost to the Ravens in Week Four, Derrick Mason let reporters know he wasn't pleased with the team's offense. "Obviously, there are some things that need to change," Mason said. "They have to change — it is evident. You saw it, there are some cracks, and nobody really wants to identify the cracks. Until we identify the cracks, we’re going to keep having the same problems. Whenever somebody wants to fill up the cracks, then we can continue to move forward." Well, it appears the Jets have indeed identified something that needed to be changed, and they've reportedly traded Mason to Houston for a conditional seventh-round pick. Mason's been in the news quite a bit lately: He was benched for the first half of the team's loss to New England on Sunday, and one report said that Rex Ryan sat him because of his mouth. Ryan denied that was the case, hinting that the benching was related to his performance, not any comments he made to the media. Meanwhile, another report claimed that Mason was one of three wide receivers who had individually gone to Ryan to complain about Brian Schottenheimer's offensive system. Ryan denied he'd had such a conversation with any of them. Still, now that Mason's gone, dots are being connected, and there's speculation that the receiver talked his way off the team. Then again, there was also that Star-Ledger report from earlier this week that Mason has been slow to learn the Jets' offense. Ryan said after Sunday's game, "Let’s face it, I thought Derrick would catch 80-90 balls." If you're keeping track, he caught just thirteen in five games with the Jets. Any other passes Mason catches this year will come while wearing a different uniform.